Much of the Metropolitan Area dodged a bullet with temperatures holding just above freezing. I don’t think anyone wanted ice so this was a good end result in what was an extremely tricky forecast. 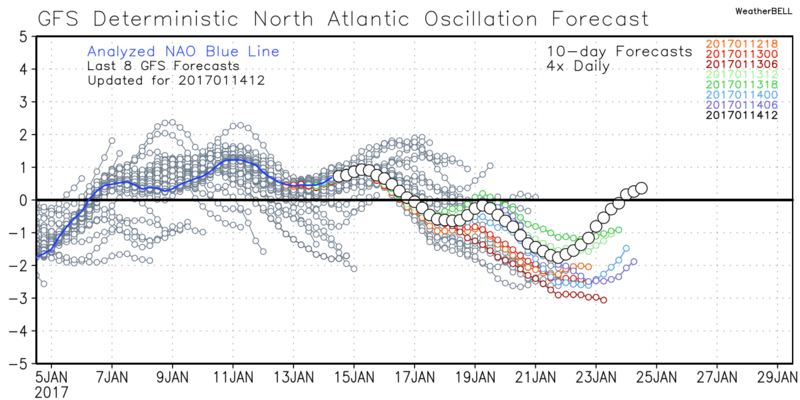 With that said, those of us who are waiting ever so patiently for a significant snow storm we will need to keep an eye out for the last weekend in January. The pattern that we have been in seems to send storm systems through the Washington Region during the Friday-Sunday time frame. 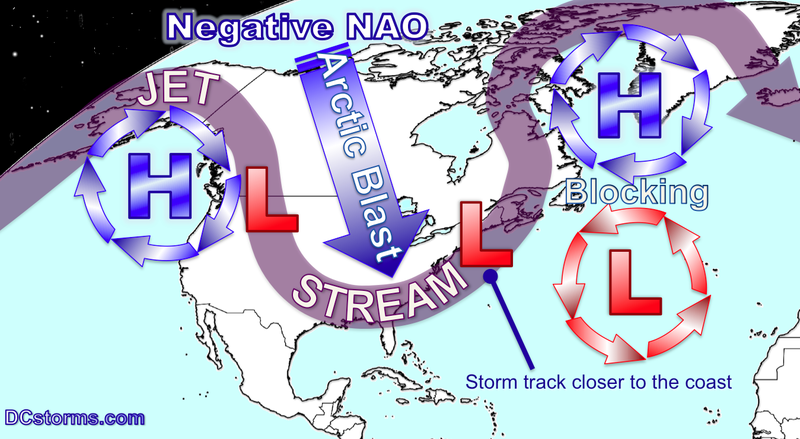 The ingredients needed for a Nor’easter off the Mid-Atlantic coast involve a negative NAO (North Atlantic Oscillation) which simply put means we need a blocking area of high pressure in the upper levels of the atmosphere over New England and eastern Canada with a trough developing near the Gulf coast. So what forms a coastal storm? A deep trough (dip in the jet stream) closing off to our southwest spawns coastal storm development due to the rapidly rising air on the right-front quadrant of the trough. In physics when you have over 100 mph winds racing overhead you get incredible lift (we do not live in a vacuum) so the air underneath (at the surface begins to rise rapidly). Secondly the strong temperature gradient (difference in temperature over a short distance) between the warm Gulf Stream waters of the Atlantic Ocean that ride along the east coast and arctic air moving in from the west (underneath the trough) act to initiate cyclogenesis (the development of a cyclone). Notice the bright orange colors over eastern Canada (upper level blocking or ridge of high pressure) and the blue colors (indicative of a trough developing over the southeastern states). 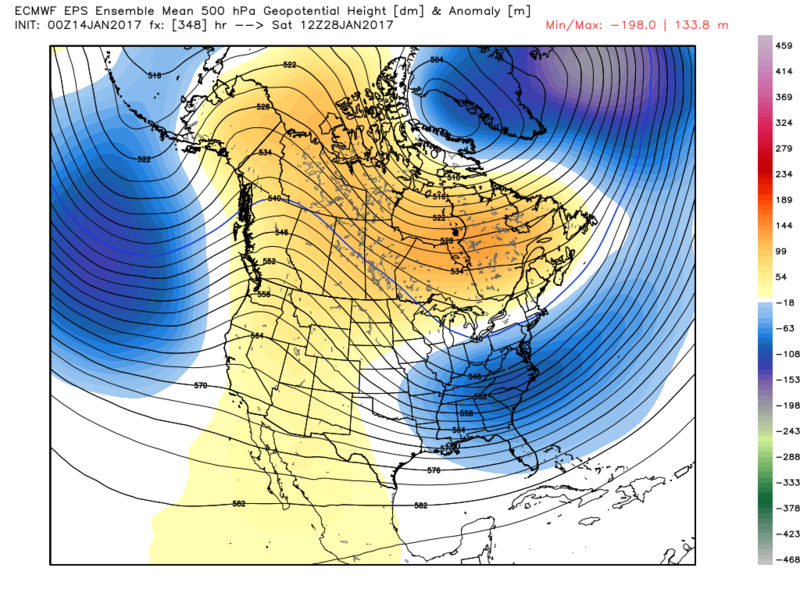 Let me be clear: I am not promising a storm I am just looking at the overall upper level pattern portrayed from the current forecast models (they are always subject to change). I will be watching to see if this forecast can hold. 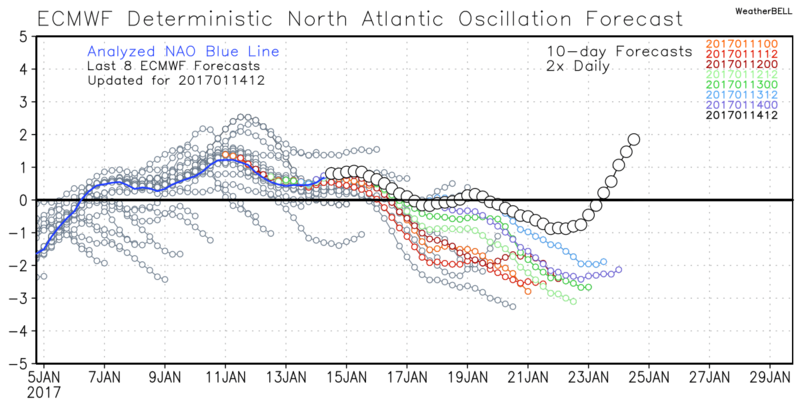 If you remember from my Winter Forecast, the analog package suggested a bitterly cold February and March. We have plenty of time to see a decent snowfall across the Mid-Atlantic.